We are saving time and money for our customers with simplicity and transparency. Simple, useful and transparent. No more chasing. Useless tenders and shady offers complicate matters for both buyers and sellers. Only real transparency can bring a stop to the endless games. Markit is the IT purchasing industry X-rayed. Enjoy direct purchases from all main IT distributors in your country - these are the suppliers that truly matter as they carry all the products available. Tendering? It is already done. For every product in our catalogue we have few different sources - the market comparison is right in front of you. Always available - only a click away. No more chasing for comparative offers. Markit pricing is simple and transparent - choose a transparent margin, simple market price or a fixed monthly fee for unlimited purchasing. A process, it grows on you. Searching, ordering, approving, returning … and again. ​Markit makes it simple. No more steps of one-to-eight. At one you are already done. We catalogue all the IT products that matter. Over a million unique IT products and two million daily updates of price and availability info from the most elite European and US IT distribution warehouses. All of it matched with extensive technical descriptions by CNET and intuitive search tools to help you find the right product every time. It starts with consolidating 160 leading IT distributors in Europe and USA. A multi-vendor catalogue is enhanced by quantity browsing and basket optimizer – both of which are to help our customers to ensure best total cost of purchasing with every order. We do not play any favourites to anyone - the market competition is yours to see. Markit is built with large and complex organisations and purchasing teams in focus. Manage a group of companies with just one login – assign users with limits and rights or decide safe categories for purchasing. We can also seamlessly integrate with existing e-procurement platforms like Coupa, Ariba, Oracle iProcurement or SAP SRM. Keep track of the order flow and organise deliveries to different locations within a single country or internationally. For every user the personal dashboard displays everything important and with billing notes and PO numbers it is easy to streamline processes. Every order ever made in Markit can be searched and found years later by any keyword or export the data to XML / Excel for further analysis. Every order ends up as an invoice so it is best to make sure they come on time and without mistakes. E-invoicing is becoming more and more popular and Markit supports most common EDI standards and delivery. Markit is not a rental company but we work with local operators to provide seamless experience for customers with lease and rent agreements. Big benefit of deploying a single system for most orders and over multiple companies is getting better and more thorough purchasing data. Simple sets like spend by brands or categories are standard. But we can also give savings report on purchasing activities or activity reports to understand the uptake.Your data is yours – you can export the order history in standard formats. Working in 28 countries and with 160 live integrations to all the main distributors makes Markit unique. 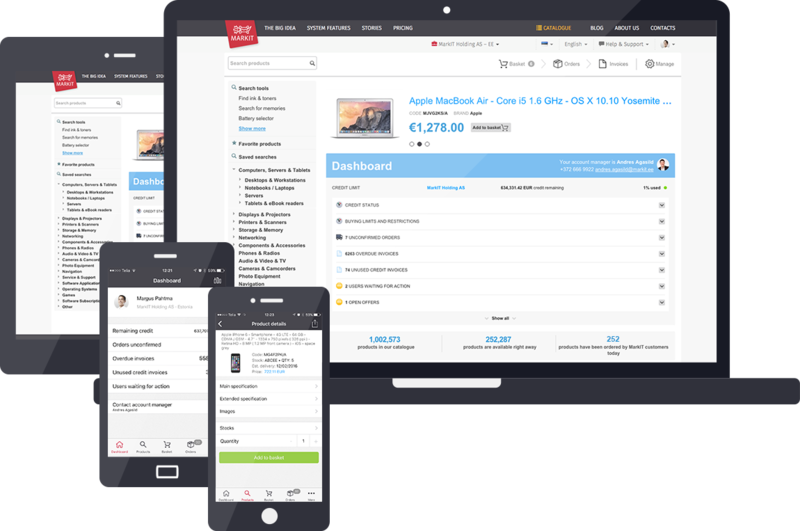 Purchase IT products from toners to servers anywhere in Europe or US within 48 hours. International customers can use Markit as a single purchasing platform for all countries. Through us they get the best of both worlds – centralised purchasing and local delivery. Pricing. As Simple And Transparent, As It Gets. Markit is for companies only. Large or small - sign up and get instant access. Choose between three simple pricing options. In the real time market price category we have added a moderate street-price margin to the best distribution prices available. already included in the price thus providing a simple solution for quick buying. Just register and go. No commitment. Register and get full access to Markit. Start buying instantly and just pay-as-you-go. To increase transparency for larger enterprises with frequent purchasing Markit offers a fixed transparent fee for all IT purchases. The customer knows the direct product price from the distribution and the fee for using the Markit system. Ask for an offer for open margin agreement. simplified pricing for IT purchasing. For a single monthly fee you can make all of your purchases with distributor prices that include delivery. Sign up to limited beta and request more information – be the first to start using Markit FIX. WHAT'S WITH THE STRANGE ANIMAL? Meet Pur! He is a completely different animal. A crocodile with antlers. Familiar, yet strange. Nordic, yet tropical. He can bite and he can poke. Markit resembles a lot of things that people have seen before, but we are none of those things exactly. Our customers know everything from an e-shop to complex purchasing software and everything in between. But no one has really combined them in the way we do. Pur is our unicorn. It stands for an exact solution with mythical perfection, chased both by us and our customers. By your desk or moving around with a tablet or a phone in your hand – Markit works everywhere. The most important functionality of Markit is also available as a native app on all popular platforms. Quickly check the status of your orders or get answers to price and availability requests on every screen – right where you are.